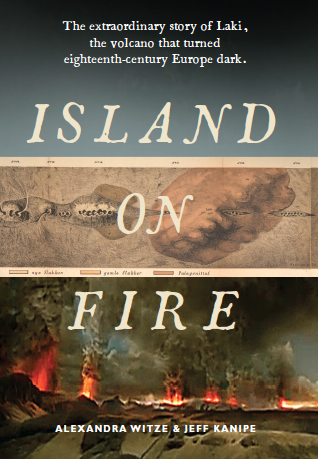 Island on Fire | The extraordinary story of Laki, the forgotten volcano that changed the world. By Alexandra Witze and Jeff Kanipe. The 1783 eruption of Laki is one of history’s great untold natural disasters. The Icelandic volcano spewed out a poisonous fog for eight months, but its effects lingered across Europe for years. It caused the deaths of people as far away as the Nile, and created famine that may have helped trigger the French Revolution of 1789. Island on Fire is the story not only of a volcano but also of the people whose lives it changed, such as the pastor Jón Steingrímsson who witnessed and recorded the events in Iceland. It is the story, too, of modern volcanology and the history and potential of supervolcanoes around the world. And in the wake of the 2010 eruption of Eyjafjallajökull, which closed European air space, it looks at how events might transpire should Laki erupt again. Explorer Nick Crane calls the book — shortlisted for the 2016 PEN/E.O. Wilson Literary Science Writing Award — “a volcanic tour de force” with “terrific story-telling.” Like the sound of that? You can find Island on Fire at lots of places including Indiebound; Powells; Barnes & Noble; Amazon US (including Kindle); Amazon UK. Island on Fire is published in the US by Pegasus Books and in the UK by Profile Books.